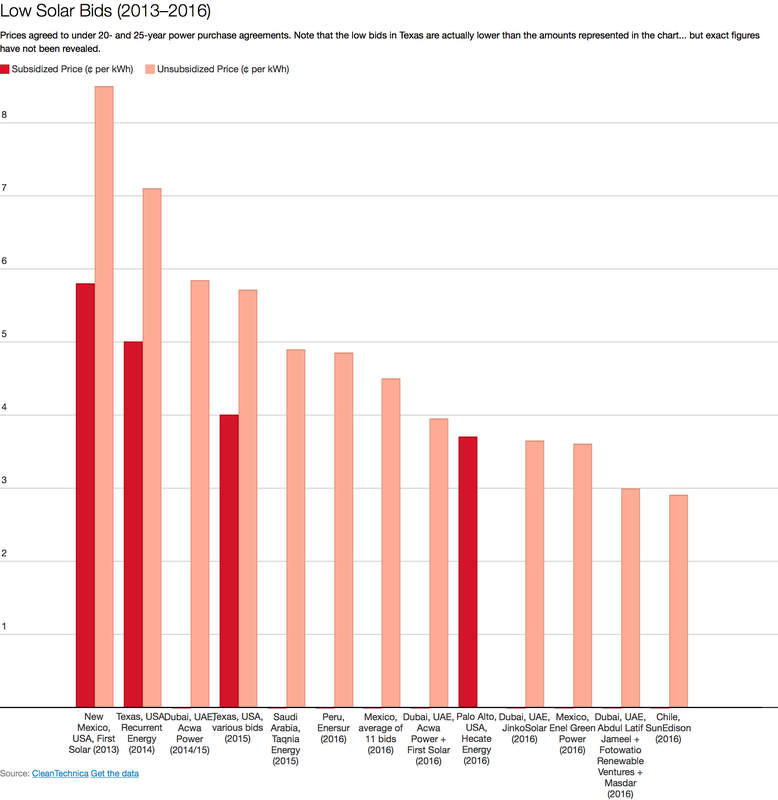 New Low Solar Price Record Set In Chile — 2.91¢ Per kWh! Originally published on sister site Cleantechies. Update #2: The lowest solar price bid is now 2.42¢/kWh. Update: It was Solarpack that set the record-low bid, not SunEdison, as originally indicated in this article. The article has been updated accordingly. 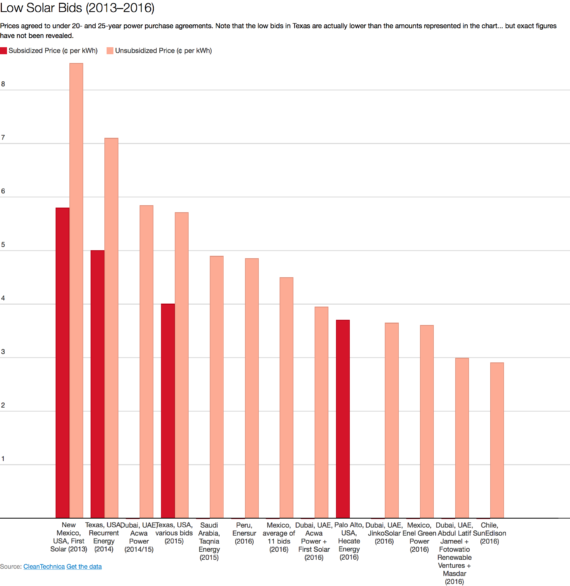 A couple of companies managed to secure a huge share in the latest electricity auction held in Chile, and auction where a new record-low solar bid was set (globally) and wind projects took 40% of the auctioned power contracts. According to media reports, Mainstream Renewable Power Ltd. and Empresa Nacional de Electricidad/Chile SA won more than two-thirds of the electricity supply auction in Chile. Meanwhile, Solarpack set a new record-low solar bid at 2.91¢/kWh ($29.1/MWh). That beats the 2.99¢/kWh bid a Masdar Consortium provided for an 800 MW solar power project in Dubai earlier this year. Overall, entities participating in the Chile power auction bid to supply a total of 12.34 TWh of electricity every year. In this auction project developers had to place bids for the price of electricity without disclosing the source. About half of the electricity supply, around 6.17 TWh, will be supplied from existing infrastructure, while the rest will require an investment of $3 billion, the energy minister of Chile stated. Mainstream has won rights to supply 3.7 TWh of electricity every year (30% of the auctioned electricity), while Endesa, a subsidiary of Enel, will supply 4.9 TWh (40% of the auctioned electricity). There was a significant correction in tariff in this auction compared to previous one. The average tariff bid in the auction declined 40% to US$47.59 per MWh compared to the previous auction. To supply the contracted electricity Mainstream will develop 7 wind energy projects with a total capacity of 985 MW. To achieve this capacity, the company is expected to invest $1.65 billion over the next 5 years. Electricity generated from these projects will be sold at tariffs between $38.8 per MWh and $47.2 per MWh. Endesa will sell 4.9 TWh of electricity every year at an average tariff of $50.83 per MWh. Media reports do not mention the type of technology Endesa will use to supply the electricity, but solar and wind power are possibilities and it’s hard to see anything else competing with them at such a low price. Enel commissioned a 160 MW solar power project in the country earlier this year. Another boost to renewable energy development may come from Spain’s Acciona, which will supply 506 GWh electricity every year. 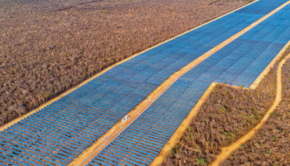 Fresh investment commitments from renewable energy project developers, like Mainstream, come as no surprise as the government recently approved legislation that will create a new interconnected transmission network to be established alongside a new independent operator. This will ensure that power generated from renewable energy projects located in remote regions of the country is supplied to population centres.